In early May I went to a grocery store and built a six pack. In the time since doing so I've discussed each beer in that pack (and then some)--well, each beer except one. That beer is Sea Dog Brewing Company's Apricot Wheat Ale. There's a reason why I've postponed writing about Apricot Wheat: I don't particularly enjoy apricots. To me, they taste way too much like oranges, which I absolutely detest. I can trace my hatred for that fruit back to my childhood when I was lactose intolerant and had to drink calcium-fortified orange juice instead of milk. I hate oranges. And, I know many people think apricots are more peachy than orangey. But I disagree. They taste like oranges. The only reason I picked up Sea Dog's Apricot Wheat Ale is because my girlfriend wanted me to get it. She liked the cute dog logo (which, to her credit is adorable). This isn't something that I would normally try. However, if I like it, I might snag more brews like this in the future. Sea Dog Brewing Company, founded in Maine in 1993, employs traditional English brewing techniques and ingredients for their brews. They took off and what started in Maine soon spread to both New Hampshire and Florida. You can now find Sea Dog brewpubs in all three states. As usual, I pulled the "about" information listed above directly from the brewery's website. 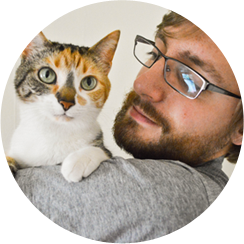 But, Sea Dog's site also talks a bit about Barney, the brewery's mascot. Apart from being the reason why the company's logo is so darn cute, the late Great Pyrenees loved water (an odd trait for his breed) and would guard Sea Dog's beers while they brewed. Also on the brewing company's website you can find a page for Apricot Wheat Ale. 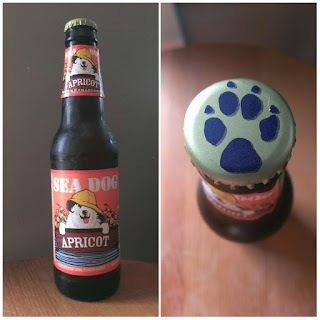 It's pretty scarce on information but it does give the ale's ingredients, says the beer is 4.6% ABV, showcases the awards the brew has under its belt, and explicitly states "Sea Dog Apricot Wheat Beer is a crisp and quenching wheat ale with a subtle essence of fresh apricots" (emphasis added by me). Subtle essence? There's hope for me liking this beer yet! Not much hope, though. The ale's aroma is decidedly apricoty. There is, if you wade through its fruitiness, a hearty wheaty scent. Now that I'm used to the aroma I actually kind of enjoy it. 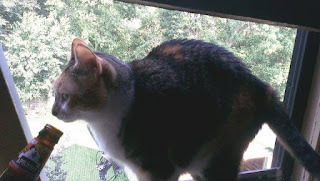 Apricot Wheat garnered a (sarcastically) whopping three sniffs from Purrl. I guess she doesn't care for it. I have to hand it to Sea Dog's page for the ale because they got it right. The apricot essence is subtle. This is a wheat beer, first and foremost. However, there is a small bite of apricot in it that is more akin to peach than orange. Looks like all those people comparing apricots to peaches are on to something. Maybe just for as far as this beer is concerned, that is. It would be remiss of me if I failed to mention that the flavor left in my mouth after swallowing (more residue than aftertaste) is distinctly orangey. Apricot Wheat Ale has all the creaminess one would expect from a wheat ale. I wouldn't call it a thirst-quencher but it's incredibly pleasant to drink. I wanted to say this reminds me of the apricot-flavored nuts that are found on grandmothers' treat tables around the holidays. But, since it's more peachy than orangey, a peach-themed memory was brought up. It's a memory from my childhood where, one late summer day, my mom took my bother and I to an orchard to pick peaches. I know that, technically, the people who own orchards and such don't like it if you sample a ton of their product while filling up your basket but my parents always thought that doing so was part of the experience. I had a good number of peaches that specific day (I probably ate more than threw in my bushel) and went home with a full, happy belly. That's the memory Sea Dog's Apricot Wheat calls to mind. 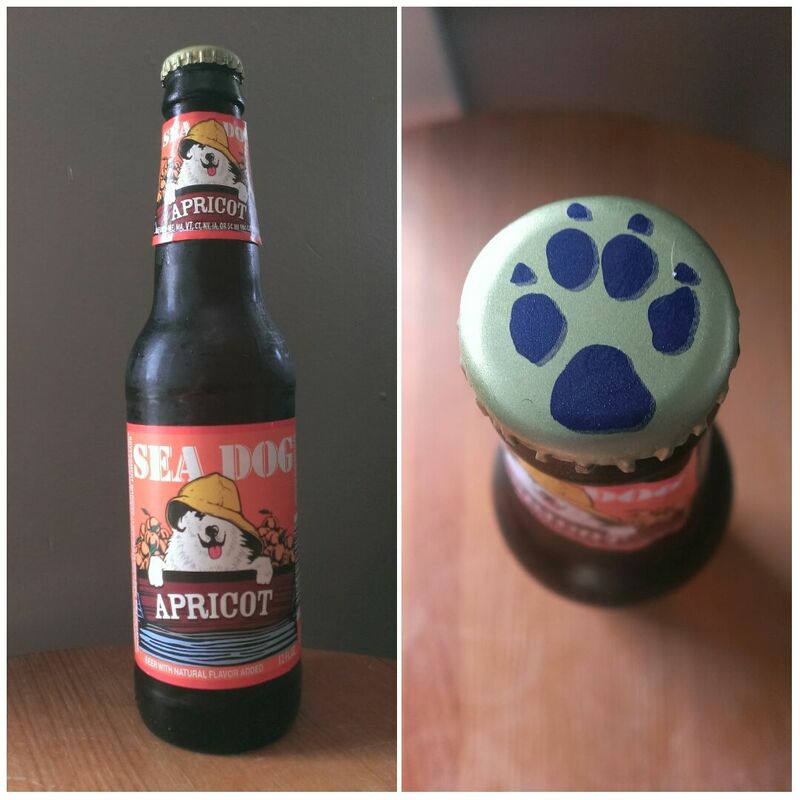 I like Sea Dog Brewing Company's Apricot Wheat Ale much, much more than I thought I would. It tastes (subjectively) better than I assumed and that Barney logo is cute, so that helps. I'm giving it 8.0/10. Looks like I'll be stepping even further outside of my comfort zone (and listening to my girlfriend more, which I should be doing anyway, right?) in posts to come. Thanks for the literal liquid courage, Sea Dog.